mommy bytes: WW - I Need Intervention! WW - I Need Intervention! 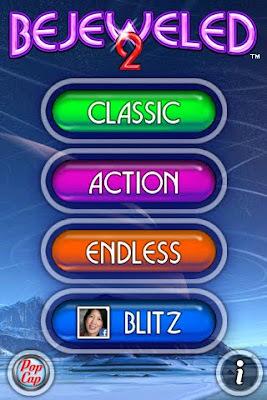 Just when I thought I kicked the Facebook Bejeweled Blitz addiction, my latest iPhone app update put up a new icon for Bejeweled2. What could be new about good ol' Bejeweled2? What's that on the bottom? Blitz? 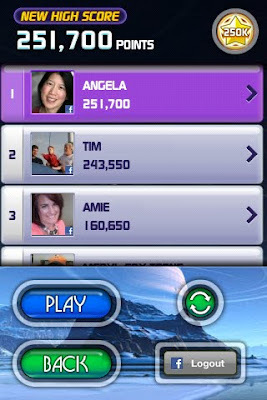 Facebook Bejeweled Blitz??? I just had to check it out. Before I knew it, I was sneaking my iPhone into the bathroom at work and playing "just one more game" instead of putting my kids to sleep. The addition of the Star Gem, where you match 5 gems in a "L" or "T" shape was brilliant as well (apparently they added it to the Facebook Bejeweled Blitz last month and I didn't even know. I told you I was cured!). I had to get a screen shot of the star gem in action. Create a Star Gem by making an L or T shape of the same color. 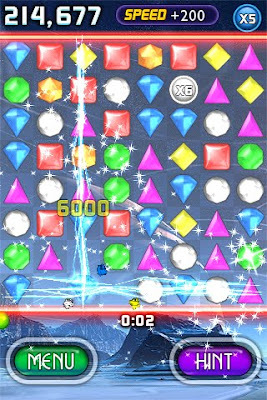 Swap a gem to explode your Star Gem (it destroys its row and column). Quickly hold the menu button followed standby button to get a screen shot while the lightning is still on the screen. Repeat until you succeed! Keep playing so you can get a high score. Ahh, I love being on top, if only momentarily. I've had two days in a row hitting over 250k. I am convinced that using the iPhone app is a lot faster than using a mouse on the computer. You can use more than one finger to swap! On a more serious note, please send prayers for Anissa Mayhew and her family, she is in the ICU after suffering a stroke. I met her for real (as opposed to at a distance at BlogHer) at Aiming Low's HP party last month. She is as funny and real as a person gets. Check Aiming Low for updates as well as searching on Twitter for #PrayersForAnissa.